Heesen Yachts has just announced the delivery of the gorgeous 51 metre superyacht Irisha to her new owner after rigorous North Sea trials. Named Trisha, this custom-built aluminium vessel aced her trials with a top speed of 26.1 knots and a cruising range of 3000 nautical miles at 11 knots. Her new owner had a very clear vision for their dream yacht right from the start of the build; Irisha had to be radical with a distinctive look unlike any other yacht already on the water. To fulfil this ambitious brief, Heesen collaborated with the Harrison Eidsgaard design studio to put unique flair into her chic exterior and interior styling. Look closely at her exterior and you’ll be reminded of a fighter jet thanks to Eidsgaard’s futuristic use of curved glass and dark panels on the raised pilot house. Her crisp nautical color scheme brings the focus back to the open ocean as the sun glistens on the flawless metallic Pacific Blue hull. Irisha’s interior spaces are just as eye-catching as her exterior with a tranquil color palette of greys and blues. To change the atmosphere in her lounges and guest cabins and provide a seamless transition from day to night, there are four different lighting settings which can be easily altered at the touch of a button. 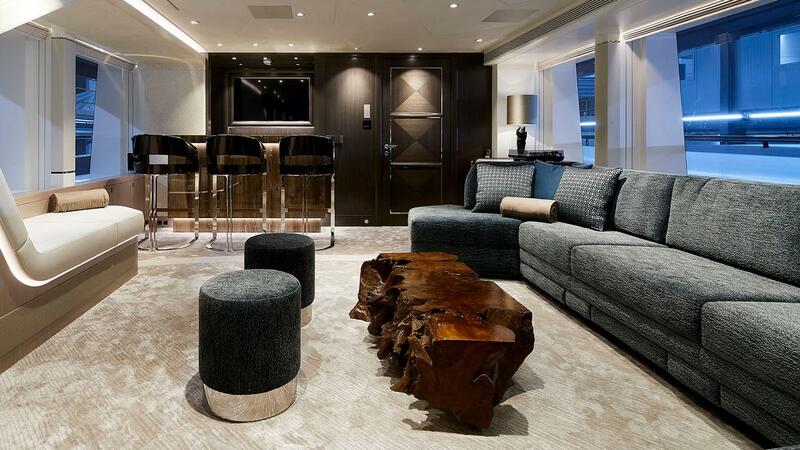 Her interior layout offers plenty of space and privacy for the guests onboard. The aft deck can easily be converted into a winter garden or outdoor dining area thanks to neat sliding glass doors. This thoughtful space can be connected with the main dining lounge, offering an 8 metre long space which can seat up to 22 guests for a formal dinner. Guest accommodation is divided between two double and two twin suites on the lower deck as well as the generous owner’s suite on the main deck which has its own private study and two walk-in dressing rooms. She can receive a total of ten overnight guests as well as a crew of nine. Irisha is scheduled to make her debut at this year’s Monaco Yacht Show in September and she will be available for charter in the Mediterranean this season with SuperYachtsMonaco.